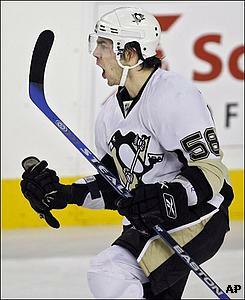 Pittsburgh's Kris Letang celebrates after scoring the game winner in a shootout against the Flames. The Calgary Flames did something only two other teams have done this season — hold Sidney Crosby without a point. But Crosby did leave the Pengrowth Saddledome with what he and his Pittsburgh teammates came for: two points. Crosby had two shots on goal but couldn’t beat Miikka Kiprusoff, who also stopped his shootout attempt. But rookie defenseman Kris Letang scored in the fourth round of the shootout to give the Penguins a 3-2 victory in Crosby’s first NHL visit to Calgary. Crosby didn’t have a shot on goal Wednesday night in Edmonton, but he set up three third-period goals in Pittsburgh’s 4-2 victory. The Flames did a better job of limiting Crosby’s opportunities to make plays. The Flames never trailed through regulation and overtime, and led 2-1 when Pittsburgh’s Gary Roberts took a high-sticking penalty midway through the third period. But Aucoin was victimized when Ryan Malone pushed the puck past him along the right boards at the Pittsburgh blue line, raced in alone and beat Kiprusoff at 11:29. Crosby had his best scoring opportunity during the overtime, when he came down the right side with speed but had trouble controlling the bobbling puck. Crosby was cheered when he stepped on the ice for the pregame skate, but with the game on the line, he was soundly booed when he stood at center ice awaiting his turn in the shootout. The crowd got even more into it when Jarome Iginla put the Flames ahead with 28 seconds remaining in the first period. Iginla deflected Alex Tanguay's wrist shot over goaltender Dany Sabourin's shoulder. Sabourin replaced Marc-Andre Fleury 4:39 into the first period. Fleury had fallen and was momentarily out of position just prior to that, but recovered to get back into the net. Pittsburgh’s Evgeni Malkin tied the game at 13:54 of the second period when he ripped a wrist shot from the right circle that beat Kiprusoff high to the short side. But Iginla put the Flames back in front at 16:23 when he tapped in Kristian Huselius’ pass after Huselius got Sabourin to commit to his left. Malone’s goal pulled the Penguins even for the second time. In the final minute of regulation, Sabourin robbed Iginla with a glove save and then Kiprusoff had to drop to his knees to stop a blast from Crosby. In the shootout, Huselius and Pittsburgh’s Petr Sykora scored in the first round. Neither team scored on the next two rounds, and Calgary’s Matthew Lombardi dribbled his attempt wide. Letang then came in, deked Kiprusoff to the ice and scored on a backhander. "If I make the first move and he goes on his knee, I can go on my backhand and put the puck high and that's what I did," Letang said. Crosby praised Sabourin, who finished with 24 saves and stopped three of four shootout tries. Crosby’s first visit to Western Canada has drawn enormous attention from fans and the media. The Penguins have Friday off before visiting Vancouver on Saturday.